It seems that there is a new penny; I had no idea. One more item for the list of things that I’ve learned on this blog. Should we really be spending money right now to redesign our money? Am I the only one who sees the irony? Yes a new penny!!! I havent seen one yet…WOO HOO good find !!!! You’d be the only human to find one of these out in BFE! I’ll be on the look out now! BFE! I haven’t heard that in a long time, and I actually know what it means. Ha-ha! Who knew?! It almost looks fake. You’ve seen the newish Lincoln pennies, yes? Just another thing to educate your fans about! I too was shocked to see the new penny arrive in my wallet. I got a few back as change while in Las Vegas on vacation. I have yet to see any here in Pennsylvania where I live though. Kind of reminds me of the K-Swiss symbol. shhh…Vegas, what happens there stays there. Would you look at those finely manicured hands?! Glad to know I’m not the only person that noticed. when you find one – let me know where….I might need one two. When Matt finishes what are we to do????? I guess it makes sense, that if you are traveling the country, you would be the one to find the new penny, vrs us who just sit at home. It seems it makes it really WORTH it. Wow, I didn’t know there was anything wrong with the old penny. This website shows the new 2010 Lincoln penny, and the 4 Lincoln pennies that were released in 2009. Got all the 2009 pennies, but still waiting to get the 2010 in my change one of these days. Guess I’ll have to go to Montana for one! I had 3 rolls of them on Sunday…..
Looks like a shiney aluminum wrapped “coin” from the old “bag of coins” kids candy from years ago. Used to be sold next to the “candy cigarettes” I think…. The Treasury made such huge fan-fare with the redesigned currency…wonder if the coins feel slighted? Sure this is not “FOOLS’ GOLD”? 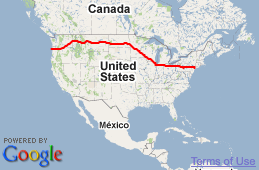 PENNY – for your thoughts as to how the your trek is going so far? Are you ahead of where you thought you would be? Are you suprised with the friendly, warm people you have met? Are you still on the same pair of boots you started with? Did you forget something you wished you had with you? The Matt Green Hobo Nation is behind you and hope your journey will continue to be safe and that the people you meet “who you may never meet again” continue to be friendly and supportive. Thats cool. I have seen like three other new designs on the back of the new penny, but not the one you were holding. I haven’t been on here for awhile, so I got some catching up to do on your travels. Hope everything is going well. Guess you didn’t get the memo! Hehehe! Your’s is the first that I have seen. Your nails seem way too clean for a guy leading a hobo’s life. I like that – the Matt Green Hobo Nation :). 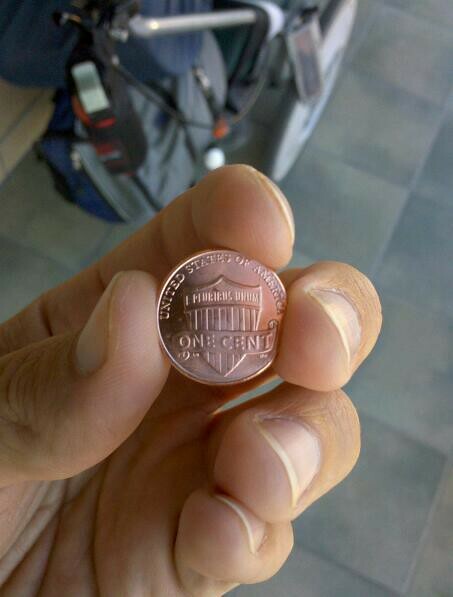 I had no idea there was a new penny :-o.
I had no idea there was a new coin either but in this age of smart phones, online banking, and debit cards… heck, I haven’t had “real” money in my pockets for years. I suppose that when I ask “How many times does Abraham Lincoln appear on the penny?” then the real answer will now be “once”. Not one bank in my town has rolls of those new pennies to sell. I called a coin shop and they said check with the U.S. mint. Sure enough, the mint sells two rolls online for $8.95.